I would read those books, which I always got as gifts for birthdays and holidays, and continually think "George probably looks like the female golfer, Babe Zaharias, and Bess probably looks like Merv Griffin in a blonde wig, being described continually as a bit chubby. I thought they made both girls seem rather unattractive so that Nancy would be seen as the dream girl, who was smart and attractive and just the best, even if Hannah Gruen thought she was wild and out of control. I would have picked Samuel Hinds as her dad, but will agree Bonita did actually look the part as described. You called that one, Lorna! Nowadays they would have Rosie O'Donnell play her in the films. Bonita did look the part but the main reason she got the gig is that she was one of the more experienced teen actors, having been in over 15 films already, and these being low budget pictures with a short production duration producer Brian Foy and director William Clemens didn't have the time or patience to deal with an inexperienced teen. It can't be overlooked that Granville was nominated for Best Supporting Actress in 1936 (the first year for this category) for These Three at the age of 13! (hey, that is a film George could have played in if it was true to the play). Yea, I'm smitten by Bonita. I always liked Bonita and thought she was top drawer in anything, even silly Nancy Drew mysteries. Her performance in "These Three" was rivetting and that film was so much more true to the original story unlike the boring Hepburn-MacLaine one. Bonita was also a very attractive girl and definitely brought Nancy Drew to life! ...You drive me crazy, Chuck. That's why romance never happens to girls with big noses. Probably because TCM does not show them. I think there are about 100, 50 at least, movies about Vietnam War or period leading up to it. 9 million people served in military during the Vietnam War and 2.7 million served in Vietnam (9.7% of the generation). That does not add in the relatives and others back home. Try and find Go Tell the Spartans with Burt Lancaster. My favorite Vietnam War movie. It is about the early period when we were rapidly increasing the numbers or "advisers." While George was not in the movies, she had a prominent role in the Nancy Drew TV series with Pamela Sue Martin, 77-79. This was a series with Nancy Drew one Week and the Hardy Boys the other. Eventually the Hardy Boys (mostly lame-O Shaun Cassidy) became the series with Nancy dropping in occasionally. Interestingly, the DVD set of Season One includes Nancy Drew and Hardy Boys, but the actual DVD's are separated into ND and HB although the shows alternated each week. Granville was about 16 at the time the movies were made and this was Nancy Drew's approximate age in the books. Pamela Sue Martin was older and played it as an older Nancy. God, I hope not. Jean Rasey did George very well in the TV series (77-79). I have the vaguest sliver of a memory of watching those in the early 1980s with my sister, who is five years older, and our babysitter. There was one I think where they (Hardys and Nancy)went to Dracula's castle or something. Wow, talk about 'jumping the shark'! I know right? The only thing that could've made it any more cheesy would be if they were converting Dracula's castle into a roller disco. I could just hear them announcing a 'blood skate' while playing the sad and disturbing song, "Timothy" by The Buoys from 1972. I don't think George was intended to be "stuck in the closet." She is clearly feminine, just like Nancy and cousin Bess. George dates Burt, one of Ned's friends. She buys feminine clothing just like Nancy and Bess. George is more of a risk taker than her cousin Bess, but that's only because Bess is a bit on the prissy side. George is always the one who falls into holes and ponds and the like. Her real name is "Georgia." I think it's funny that in the 60s/70s Peanuts cartoons, Peppermint Patty was voiced by a boy actor. Her real name is Patricia. I can see how people might misconstrue Patty and Marcie's relationship, seeing that Marcie calls her "sir," but I think Patty is just really awkward, nothing else. I think Marcie's "sir" is her way of making fun of Patty's masculine tendencies. I doubt that Charles Schultz would be intentionally introducing lesbian children in his 1960s-1970s comic strip. I personally liked the other Patty better. She was friends with Lucy, Violet and Freida with her "naturally curly hair." I stand corrected. Of course my defense is that I haven't read a Nancy Drew book in over 40 years. (but as a lad I was really into them (as well as Encyclopedia Brown), and my friends would tease me about that). I think it's funny that in the 60s/70s Peanuts cartoons, Peppermint Patty was voiced by a boy actor. Her real name is Patricia. I can see how people might misconstrue Patty and Marcie's relationship, seeing that Marcie calls her "sir," but I think Patty is just really awkward, nothing else. I think Marcie's "sir" is her way of making fun of Patty's masculine tendencies. Actually I believe that Nancy Drew was conceived by a man, Edward Stratemeyer who was the founder of Stratemeyer Syndicate. He first developed The Hardy Boys and after the series proved successful with girls in addition to boys, he developed a series about girl detective Nancy Drew. He hired Mildred Wirt Benson to write the Nancy Drew series under the pseudonym Carolyn Keene. Benson wrote the first 23/30 Nancy Drew books with other writers contributing here and there to the series. Benson is the writer who is credited with developing the Nancy Drew character. Benson stopped writing Nancy Drew in the late 1940s. There are a handful of male ghost writers who contributed to the series, but most of the original 56 books (before Nancy Drew switched publishers, and as I understand it, the series took a different turn) were written by females. After Benson left the series, Stratemeyer's daughter, Harriet took over writing duties. I always thought it was funny that Nancy didn't seem to have a job. She was 18, had already graduated from high school and seemed to have all the time in the world. She also seems to have an endless supply of money and even has a charge account at the local River Heights department store. Nancy's father, "high powered lawyer, Carson Drew" as the books like to say, must have made a lot of money. Nancy was always able to travel on a whim, or travel with her father as he researched legal cases that he had taken on. Nancy's friends, George and Bess, and Nancy's boyfriend Ned, along with George and Bess' boyfriends, Burt and Dave, always seem to show up on Nancy's trips too. Either they are invited, or they just happen to be there. I will say too that the very first Nancy Drew, The Secret of the Old Clock, is very poorly written. The author uses way too many adjectives and adverbs, which causes the writing to sound very flowery and over-the-top. Fortunately, in the second book, The Hidden Staircase, the writer toned it down and the book is easier to read and digest. Even though these books were originally written for children, I find them a very enjoyable quick read. Even though there isn't really any continuity between the books, except for a throwaway line at the beginning and end of the book to link the book to the one preceding and succeeding it, I am reading them in order. I am on #19, The Quest of the Missing Map. A while back, I researched the history of Nancy Drew, which is how I learned all about Stratemeyer Syndicate. To add how I knew so much about Nancy's history. Nancy Drew is great! Don't feel ashamed. Lol. I haven't read Encyclopedia Brown, but I've heard of it. My dad apparently liked reading those when he was a kid. Oh okay. So it's either a weird quirk of Marcie's or something she does to annoy Patty. Her performance in "These Three" was rivetting and that film was so much more true to the original story unlike the boring Hepburn-MacLaine one. Except that they couldn't mention the lesbian relationship that was the accusation in the original play. 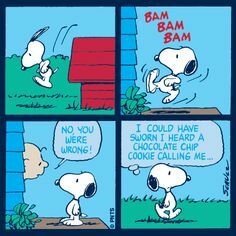 Well, talking about straight or not, at least we know Snoopy was heading straight to those chocolate chip cookies whenever they sang to him in the middle of the night. Some cookies do that, ya know. 10:30 pm. 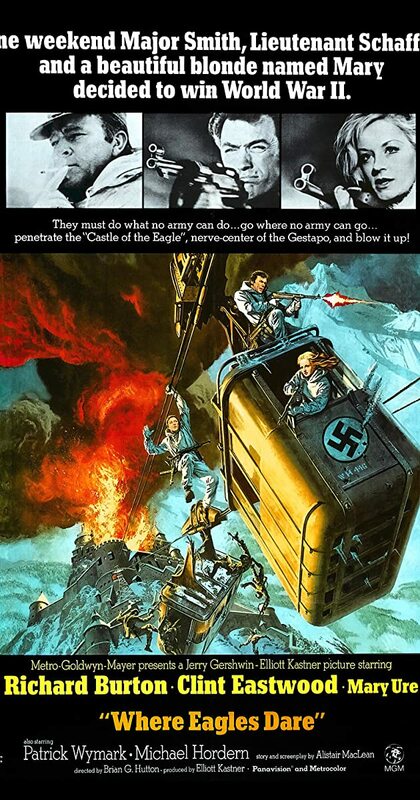 Where Eagles Dare (1968). Another good Alastair MacLean WWII Commando picture. I remember seeing this at the huge Odeon Carlton in Toronto. Plus, a boffo film score by Ron Goodwin, using a Baroque-like fugue. I read the ENCYCLOPEDIA BROWN books and I have numerous issues with them. Aside from the fact that the town he lived in seemed to be populated with some mentally disturbed "Archie" comic rejects, he routinely got confessions from people using the most specious and spurious of evidence. Like something that would in no way shape or form hold up in court at all. Not even a sixth season episode of DIAGNOSIS MURDER would hinge a plot on evidence like that. Orson Welles in "touch of evil" would call into question the methods of encyclopedia brown. OMG WHY ARE YOU ALWAYS DEFENDING GEORGE AND HATING ON BESS??!?! JUST BECAUSE BOBBY RUSSELL ASKED HER AND NOT YOU TO WINTER FORMAL!!!!! !